Most people associate the name Goethe with one of his greatest works "Faust", a drama in two parts, often referred to as his magnum opus. However, Goethe's rebellion and passion, his poetic as well as highly creative spirit has left a mark on our world in many ways. After a good home education, Goethe went to study the law at Leipzig University in 1765, at the age of 16. He had no appreciation for the studies and much rather visited the poetry lessons of Christian Fürchtegott Gellert. He also studied drawing with Adam Oeser. 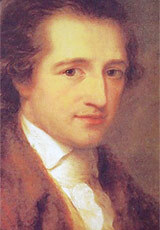 Goethe (age 38), by Angelica Kauffmann, in 1787. In 1771 he was certified and began practising law in Frankfurt, and then Wetzlar. He was offered a career in the French government but he didn't want to commit himself. He wanted to remain and "original genius". In 1773 his first success came with a tragedy "Götz von Berlichingen". The 16th century story of a robber baron was in fact Goethe's youthful protest against the established order and a demand for intellectual freedom. His first novel, "Die Leiden des jungen Werthers" (The Sorrows of Young Werther) was published in 1774 and brought him great fame as a writer. It is considered by some to be the spark that ignited the period and movement of Romanticism. Based on this success he was invited to the court of Carl August, Grand Duke of Saxe-Weimar-Eisenach. He moved to Weimar and remained there for the rest of his life. In time he become the Duke's chief adviser, but he was also his friend and confidant. Goethe was ennobled in 1782 (thus the "von" addition to his name). Goethe and Schiller monument in Weimar, Germany. Sculpted by Ernst Rietschel, in 1857. He travelled to Italy, a journey similar to one his father made in his youth. Goethe wrote: "To have seen Italy without having seen Sicily is to not have seen Italy at all, for Sicily is the clue to everything." During his years in Weimar, before he met Schiller, Goethe wrote Wilhelm Meister's Apprenticeship, the dramas Iphigenie auf Tauris (Iphigenia in Tauris), Egmont, Torquato Tasso, and the fable Reineke Fuchs. In 1794 Friedrich Schiller wrote to Goethe offering friendship. 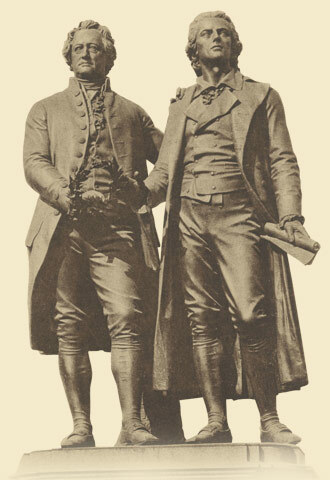 The two remained friends until Schiller's death in 1805. In the period during his friendship with Schiller, he created Wilhelm Meister's Journeyman Years (the continuation of Wilhelm Meister's Apprenticeship), the idyll of Hermann and Dorothea, and the Roman Elegies. After 1805 came Faust Part One, Elective Affinities, the West-Eastern Divan (a collection of poems in the Persian style, influenced by the work of Hafez), his autobiographical Aus meinem Leben: Dichtung und Wahrheit (From My Life: Poetry and Truth) which covers his early life and ends with his departure for Weimar and his Italian Journey. As Faust Part One was released, it created a sensation. The first operatic version, by Spohr, appeared in 1814. Faust was an inspiration for operas and oratorios by Schumann, Gounod, Boito, Busoni, and Schnittke as well as symphonic works by Liszt, Wagner, and Mahler. In 1810 Goethe, who was always very interested in the visual arts, wrote "Zur Farbenlehre" (Theory of Colours). He rejected a mathematical approach in the treatment of color, and argued that light, shade and color are associated with an emotional experience: "Every color produces a distinct impression on the mind, and thus addresses at once the eye and feelings". Goethe was, along with Schiller, one of the leading figures of Weimar Classicism and he inspired numerous writers and philosophers that followed: Hegel, Schopenhauer, Nietzsche, Carl Jung, and Ludwig Wittgenstein, to just name a few. Johann Wolfgang von Goethe was born on August 28th 1749. His father was a lawyer and mis mother was the daughter of the Mayor of Frankfurt. Goethe had a comfortable childhood during which he was greatly influenced by his mother from whom he got the gift for story telling. He was the first child, and except for his sister, Cornelia Friederike Christiana, who was born a year after him, all the other siblings died at an early age. He had an irregular and informal education, and mostly educated at home through private tutors, especially in Latin, French, Greek and English. He disliked the church, whose history he considered a wild mix of mistakes and violence, and he had a passion for drawing. An unhappy love affair inspired his first play "The Lover's Caprice" in 1767. Later, during his period in Weimar, he loved Charlotte von Stein, an older married woman, but their relationship remained platonic. 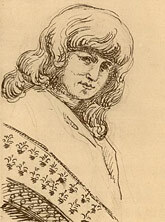 As his emotional dependance on Charlotte deminished, he came together with Christiane Vulpius. She was his mistress since 1789, but it wasn't until 1806 that he married her and they had a son together, Karl August. Below are only some of Goethe's most famous literary works.